I had no idea what I was in for when we had kids. I have a touch of OCD, and I like my home clean, neat and organized. Especially the kitchen. I know, some of you are already laughing. When I lived alone in an apartment, I traveled for work a lot. As in about 80% of the time. My apartment was usually immaculate. As in, company could drop by in 5 minutes or less as I tucked away the 3 pairs of shoes I’d left out. Yeah, I know, and I’m still awful about my shoes. Then, I got married. Marriage involves compromise, and my husband has never been as compulsive about cleaning as I have. As a matter-of-fact, we sat down and made a house-cleaning list so that he would understand everything I thought that needed to happen in order for the house to be considered clean. The end list required compromise. My mother used to spend every Saturday cleaning our house and she drilled into me what was expected. I was never as good as she was (sorry mom! ), but I tried. DH loosened those standards a bit more. And that was on Saturdays where we bothered to clean. 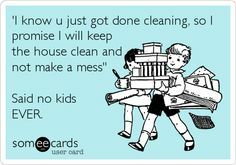 There was so many things that we wanted to do, that we tried to clean the house once a month or when “comany” was coming over. This worked for a long time. Well, for the seven years of our marriage that we didn’t have kids. Then we added a child. That was rough. Working full-time and taking care of a child, even with my husband’s help, was hard. Especially as there was so much more work to do. I couldn’t believe the amount of mess one small child could create. Until that child grew a little older. Then she made even more of a mess. Then we had a second child. 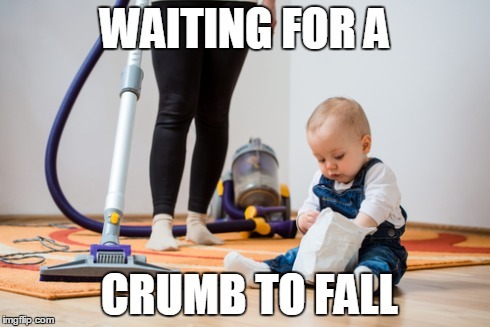 My house hasn’t been really, truly clean since…well, since the Christmas after our first child was born when we were hosting. We made a real effort to truly clean the house. All of it. Haven’t done it since, though I told myself things would change as the kids got a little older. 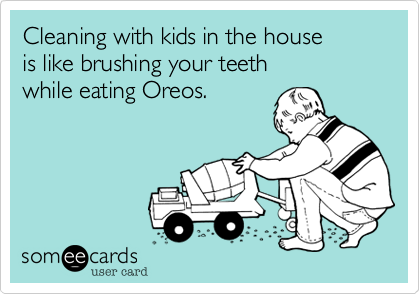 I had assumed that children could be taught to clean up after themselves, especially once they were no longer toddlers. More experienced parents are now wiping tears of laughter from their eyes. We grow, change and adapt. And I simply didn’t have the time or energy needed to keep my house clean anymore. So, I had to adapt. This didn’t quite work out for me as DD1 was terrified of the vacuum. Adapt I did. How much I’d changed was brought home to me hard the other morning as I was picking up toys, again, and putting them away when I found a crust of peanut butter and jelly toast tucked onto one of DD2’s bookshelves. Clearly, she was saving this for later. My pre-child self would have been utterly horrified. My post-child self sorta shruged, threw it away, and decided it was time to take a break and check my e-mail. How about you? Do you keep your house super clean? Is cleaning a weekly ritual? Monthly? When you have guests? 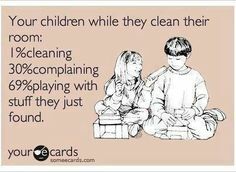 Have you found it super difficult to keep things clean with children? It is a struggle, one I’m loosing but I haven’t surrendered yet! !